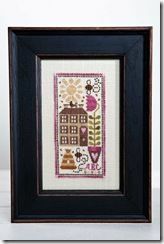 "Collection of Houses n°5" is a cross-stitch chart with instructions translated in English. The fabric used by the designer is available in the "related products" section below in 32 count. The model on the picture has been stitched as a miniature on a 32 count linen fabric (colour "Platinium") using one strand of cotton over one thread of fabric. But you can work it with two strands of cotton over two threads of fabric.